PLEASE READ THE ARTICLE. It seems obvious to me that nearly 100% of the comments I've read are from people who either didn't read the original article at all, or who read the lede and ran off to rant. At least one fellow thought it was about school lunches. So we're talking about an elementary school. They begin in kindergarten, and this is obviously in the context of the students getting to know one another as they progress in their lessons. It's also a "diverse school". How diverse, exactly? Well, 50% of the students at Scott are Hispanic; another 15% are black and 9% percent are Asian, leaving the 26% as all other ethnicity, including Caucasian. The school's students are predominantly from low-income families. 85% percent are eligible for free or reduced-price meals. So exposure to other cultures might be something that these students haven't gotten in the home. Also, there's the logic. 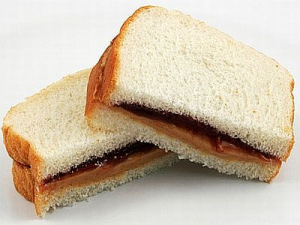 If a minority student in a class is disadvantaged by the mere mention of a PB&J sandwich, then it's logically inescapable that a classroom of mainstream American children will be similarly disadvantaged if we start throwing mentions of pita in their direction. Conversely, if the mainstream American students will benefit from the cultural diversity of the pita; so will the minority student benefit from the cultural diversity of the PB&J. Obviously, no matter what you choose, if you accept the logic, then someone is going to suffer. Should you "even the playing field" and thus deliberately disadvantage the majority of your students? Or should you play the odds and lower your educational costs by focusing attention on the disadvantaged minority? And what do we mean by "minority"? Remember, at most 26% of Gutierrez's students are White. This "sandwich issue" is blown out of proportion by both sides, both of which overestimate the harm and underestimate the children by focusing on something as blatantly silly as a sandwich, or even food in general, when the original Portland Trib article had precious little to do with that, and certainly had nothing to do with school lunches. Discussion of the sandwiches distracts from the meatier issue of racism in the schools, and I list this as separate and distinct from cultural diversity. You see, insensitivity to cultural diversity is not malicious. It's a simple matter of ignorance or inattention. It's solved with simple, friendly education and should draw no more attention than a math problem. We are a culturally diverse society. That has always been the case. The United States of America was once termed a "melting pot" of different cultures that became homogeneous. Multiculturalists have used the term "salad bowl" to denote different cultures that mix, yet remain distinct. I don't like the first, because it's inaccurate, and I don't like the second because it's isolationist. People are changed by their interactions, so as for me, I prefer "Mulligan Stew"... different ingredients gathered from who-knows-where, simmered so that their flavors mix and are improved in the process. Every ingredient recognizable, with the whole being new and unique. You might like the meat, but you love the stew. Racism, though, is deliberate, even when it's unintentionally racist.. Last year, Gutierrez herself approved a weekly lunch-time drum class for Black and Latino boys. She defended the class with a statement that implied there do exist similar programs that are restricted to white boys. Gutierrez has a problem with the facts here. First of all, it's not OK when White people do it; neither in, nor out of school. For instance, there is not (nor do I believe there needs to be) a "Miss White America" pageant. Secondly, if it is OK at her school, then it's her fault. She's the Principal. And though her complaint clearly indicates that she thinks it's not OK when White people do it, she also thinks it is OK when minorities do, and that's a double-standard that she is perpetuating. So why am I pointing out that a person like Gutierrez, both well educated and consciously contemplating the problem, is still subtly racist herself? Because it goes both ways, and we cannot ignore that. Nobody is immune to criticism. Nobody is exempt from racial bias. Nobody. And to be perfectly honest with you, I don't particularly have a problem with some double-standards. You don't have the stew if individual cultures aren't allowed to celebrate their heritage and maintain their identity. But in doing so, you should celebrate the differences, and share them. Don't stick them in a ghetto. Whether it's Chinese New Year, or St. Patrick's Day, or the Scottish Games, or Cinco de Mayo, or Black History Month, celebrate the differences. I think it's silly to "mind" when the Boy Scouts admit boys and the Girl Scouts admit girls. So what? Do you believe that people have the freedom of assembly and association, or are those just outdated concepts, to be replaced by forced associations, and prohibitions against assemblies by some people? We have brains, people. We have eyes and ears. We can see plainly that there are differences between people. We know from experience that people like to congregate with other people like themselves. It is silly to ignore that. But we also know from experience that all people are people. We should be openly curious and tolerant of other cultures. And no one should be castigated for his "ignorance" as a result of open inquiry, nor berated for desiring to flock with "birds of a feather", even if he's White. If he deliberately avoids other people, that's a matter of more concern. 74% of the students at the school in question are non-white. Not one of them is an animal. Being children doesn't make them stupid. Certainly there is a balance to be maintained; and just as we don't want to disadvantage anyone, we also don't want to insult their intelligence by implying that they can't understand "half a sandwich" as opposed to "half a taco". Use the taco, sure... but don't claim stupidity on their part as a reason. We also have to remember our immediate surroundings, so as to avoid the blatant hypocrisy of telling children who comprise 26% of a given population that they are the "privileged majority". I do speak from demonstrable experience here. I'm providing a link to the current demographics of my high school. It's changed a bit since I was there: I was part of a non-Black population of around 17%. Please note the numbers under "Student Grade and Ethnicity". Then consider that I was most assuredly considered a "privileged majority", and reminded of it daily. I seriously doubt things have changed for the six students in the green sliver. For years, national standards for education have given us the result that a poor or lower-middle-class White kid going to a predominately Black school can be told he needs cultural training because he is "privileged" relative to often more affluent Black children surrounding him on all sides. Obviously, this is absolutely ridiculous, illogical, and indefensible by means of purely rational argument. For those who don't believe that a child "in the sliver" can't understand racism, I invite you to stare at that diagram until you comprehend it. I despise racism, and I'm letting you in on why. People are people. Nevertheless, I'm going to get roundly criticized or called a racist myself for having stated the obvious. Clearly, what is or is not a minority differs from place-to-place in the experience of the people who actually live there. This, of course, makes no difference to the Authoritarians (both Democrat and Republican) who push national standards of "excellence" that have absolutely nothing to do with anything in these kids' personal experience. For this and other reasons, "standardized" education is just plain stupid. Education should be kept close to home and respond to the needs of the local citizenry. Applying a curriculum that is appropriate to an average of a far-flung and distant nation is guaranteed to be inappropriate to most of the individuals of that same diverse nation. It seems fairly obvious that the first thing a teacher should do is look around the room. Teachers should teach their students, and have the flexibility to adjust their curriculum accordingly. Every teacher has a degree... how about we start treating them like they earned it?